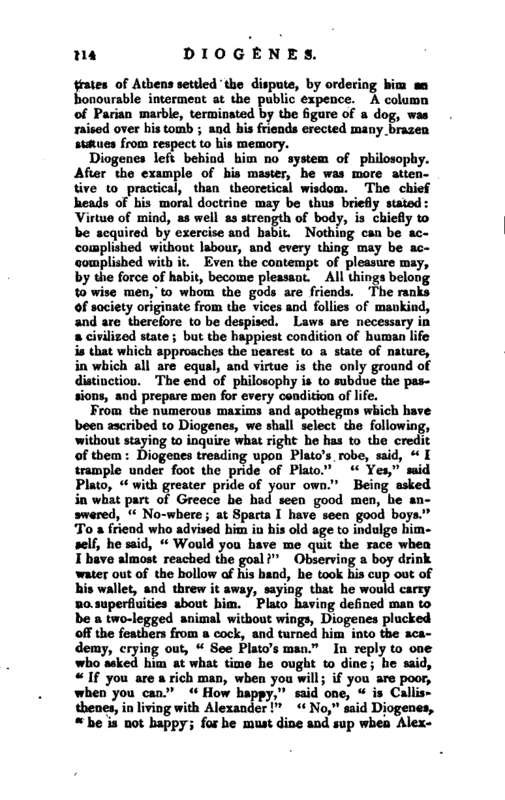 , a celebrated Cynic philosopher, was born in the third year of the ninety-first olympiad, or 413 B.C. at Sinope, a city of Pont us. His father, who was a banker, was convicted of debasing the public coin, and was obliged to leave his country. 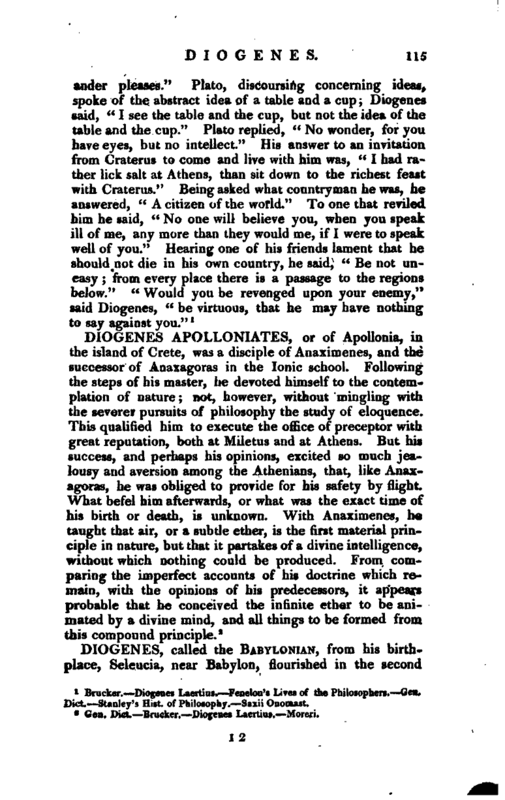 This circumstance gave the sou an opportunity of visiting Athens, where he offered himself as a pupil of Aniisthenes; but that philosopher happening to be in a peevish humour, refused to receive him. Diogenes still importuning him for admission, Antistheues lifted up his staff to drive him away; upon which Diogenes said, “Beat me as you please; I will be your scholar.” Antisthenes, overcome by his perseverance, received him, and afterwards made him his intimate companion and friend. Diogenes perfectly adopted the principles and character of his master, and renouncing every other object of ambition, he determined to distinguish himself by his contempt of riches and honours, and by his indignation against luxury. He wore a coarse cloak; carried a wallet and a staff; made the porticoes and other public places his habitation; and depended upon casual contributions for his daily bread. A friend, whom he had desired to procure him a cell, not executing his order so soon as he expected, he took up his abode in a tub, or large open vessel, in the Metro urn. 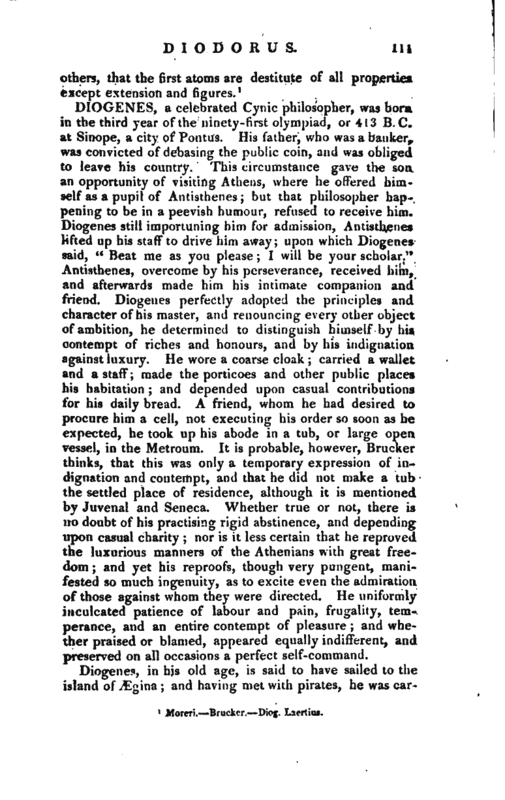 It is probable, however, Brucker thinks, that this was only a temporary expression of indignation and contempt, and that he did not make a tub the settled place of residence, although it is mentioned by Juvenal and Seneca. 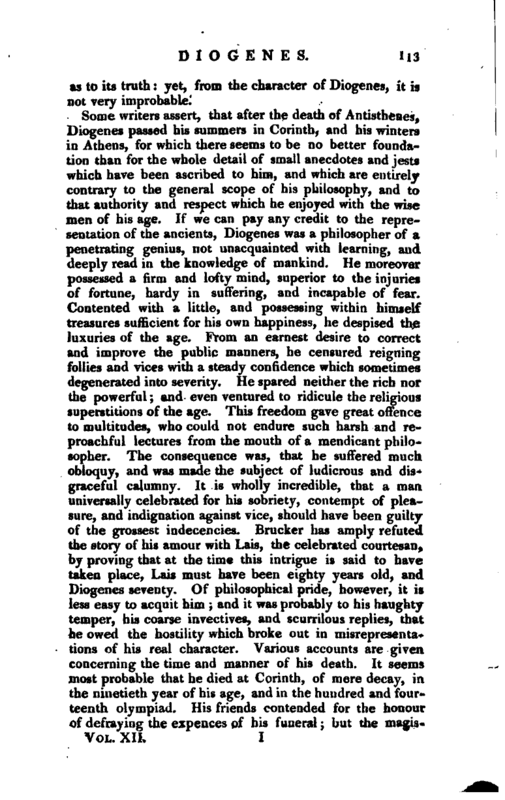 Whether true or not, there is no doubt of his practising rigid abstinence,and depending upon casual charity nor is it less certain that he reproved the luxurious manners of the Athenians with great freedom; and yet his reproofs, though very pungent, manifested so much ingenuity, as to excite even the admiration of those against whom they were directed. He uniformly inculcated patience of labour and pain, frugality, temperance, and an entire contempt of pleasure; and whether praised or blamed, appeared equally indifferent, and preserved on all occasions a perfect self-command. Diogenes, in his old age, is said to have sailed to the island of Ægina; and having met with pirates, he was | carried into Crete, and exposed to public sale. Being asked what he could do? he replied, “I can govern men, and therefore sell me to one who wants a master:” Xeniades, a wealthy Corinthian, being struck by this singular reply, purchased him; upon which Diogenes told him, “I shall be more useful to you as your physician, than as your slave.” Upon their arrival at Corinth, Xeniades gave him his liberty, and committed to his direction the education of his children, and the management of his domestic concerns. Xeniades had so much reason to be satisfied with his judgment and fidelity, that he used to say the gods had sent a good genius to his house. He accustomed his pupils to the discipline of the Cynic sect, and took greater pains to inure them to habits of self-command, than to instruct them in the elements of science. However, he was not negligent in teaching them lessons of moral wisdom, which he inculcated by sententious maxims; and he allowed them the moderate use of athletic exercises and hunting. During his residence at Corinth, he frequently attended the assemblies of the people at the Crancum, a place in its vicinity; and at the Isthmian games, where he appeared under the character of a censor, severely lashing the follies of the times, and inculcating rigid lessons of sobriety and virtue. At one of these assemblies the conference between Alexander the Great and Diogenes is said to have happened. Plutarch relates the story thus: Alexander received the congratulations of all ranks on his being appointed, after the death of his father, to the command of the Grecian army in their projected expedition against the Persians. Diogenes was absent on this occasion, and Alexander expressed his surprise at this circumstance. Wishing to gratify his curiosity by the sight of such a philosopher as Diogenes, he visited the Craneum, where he found the philosopher sitting in his tub in th sun. The king came up to him in the crowd, and said, “I am Alexander the Great;” to which Diogenes replied, in a surly tone, “and I am Diogenes the Cynic.” Alexander, requesting to know if he could render him any service, received for answer, “Yes,” says he, “do not stand between me and the sun.” Alexander surprised at the magnanimity of this reply, said to his friends, “If I were not Alexander, I would be Diogenes.” There are several circumstances in this narrative which suggest some doubts | as to its truth yet, from the character of Diogenes, it is not very improbable. 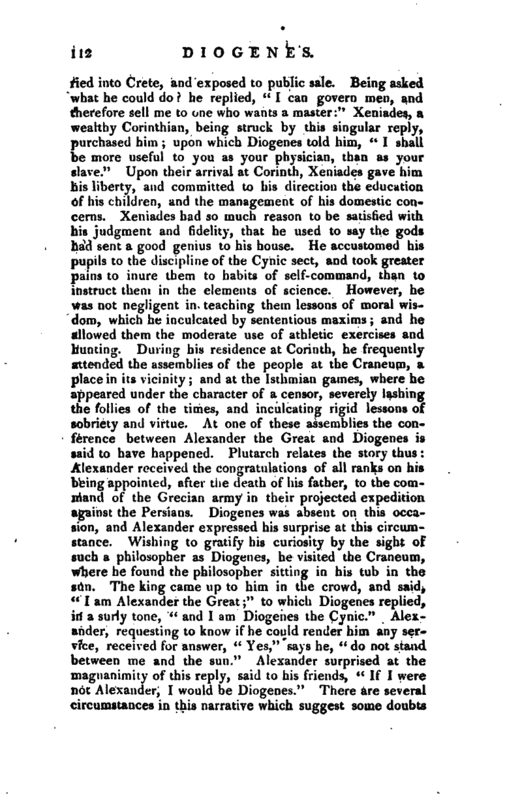 Some writers assert, that after the death of Antisthenes, Diogenes passed his summers in Corinth, and his winters in Athens, for which there seems to be no better foundation than for the whole detail of small anecdotes and jests which have been ascribed to him, and which are entirely contrary to the general scope of his philosophy, and to that authority and respect which he enjoyed with the wise men of his age. If we can pay any credit to the representation of the ancients, Diogenes was a philosopher of a penetrating genius, not unacquainted with learning, and deeply read in the knowledge of mankind. He moreover possessed a firm and lofty mind, superior to the injuries of fortune, hardy in suffering, and incapable of fear. Contented with a little, and possessing within himself treasures, sufficient for his own happiness, he despised the luxuries of the age. From an earnest desire to correct and improve the public manners, he censured reigning follies and vices with a steady confidence which sometimes degenerated into severity. He spared neither the rich nor the powerful; and even ventured to ridicule the religious superstitions of the age. This freedom gave great offence to multitudes, who could not endure such harsh and reproachful lectures from the mouth of a mendicant philosopher. The consequence was, that he suffered much obloquy, and was made the subject of ludicrous and disgraceful calumny. It is wholly incredible, that a man universally celebrated for his sobriety, contempt of pleasure, and indignation against vice, should have been guilty of the grossest indecencies. Brucker has amply refuted the story of his amour with Lais, the celebrated courtesan, by proving that at the time this intrigue is said to have taken place, Lais must have been eighty years old, and Diogenes seventy. Of philosophical pride, however, it is less easy to acquit him; and it was probably to his haughty temper, his coarse invectives, and scurrilous replies, that he owed the hostility which broke out in misrepresentations of his real character. Various accounts are given, concerning the time and manner of his death. It seems most probable that he died at Corinth, of mere decay, in the ninetieth year of his age, and in the hundred and fourteenth olympiad. His friends contended for the honour of defraying the expences of his funeral but the | magistrates of Athens settled the dispute, by ordering him an honourable interment at the public expence. A column of Parian marble, terminated by the figure of a dog, was raised over his tomb; and his friends erected many brazen statues from respect to his memory. Diogenes left behind him no system of philosophy. After the example of his master, he was more attentive to practical, than theoretical wisdom. The chief heads of his moral doctrine may be thus briefly stated: Virtue of mind, as well as strength of body, is chiefly to be acquired by exercise and habit. Nothing can be accomplished without labour, and every thing may be accomplished with it. Even the contempt of pleasure may, by the force of habit, become pleasant. All things belong to wise men, to whom the gods are friends. The ranks of society originate from the vices and follies of mankind, and are therefore to be despised. Laws are necessary in a civilized state; but the happiest condition of human life is that which approaches the nearest to a state of nature, in which all are equal, and virtue is the only ground of distinction. The end of philosophy is to subdue the passions, and prepare men for every condition of life. Brucker.—Diogenes Laertius.—Fenelon’s Lives of the Philosophers.—Gen. Dict.—Stanley’s Hist, of Philosophy.—Saxii Onomast.